Jerome and Louise chose to live in Florida for their retirement. After many good years, their physical health declined. Unfortunately, both were hospitalized at about the same time, then discharged to a rehabilitation facility. After concluding physical therapy, Louise still required high cost nursing care while Jerome was able to move to assisted living. Both Jerome and Louise were mentally competent, but neither could return home safely. Their situation was complicated by the fact that they had no children or surviving family. Jerome and Louise requested our office to help manage their new and difficult situation. As you can imagine, they were anxious and confused about their future. They were incurring over $10,000 a month in uncovered health care expenses. A neighbor, trying to help, threw their financial papers in a Publix shopping bag and brought the chaos to us. First, we found both Jerome and Louise a suitable person to serve as their Agent under a Durable Power of Attorney. Now we had someone with financial authority to deal with the banks. After that, we set out to protect their life savings. We transferred ownership from Jerome’s and Louise’s various but limited assets into two separate Medicaid exempt “pooled trusts.” Pooled trusts can only have one beneficiary, so two trusts were needed. Pooled trusts are wonderful creatures of federal law! They allow disabled Floridians of any age to put money in trust for their own future needs. The great thing about pooled trusts is that Medicaid will not count the pooled trust money against Medicaid’s modest $2,000 asset limit. So after we transferred Jerome’s and Louise’s assets to their separate pooled trusts, we applied for and received Medicaid benefits to pay a good bit of their long term care expenses. Sound too good to be true? Well, the disadvantage of a pooled trust is that the State Medicaid Program has a lien. That usually means that when the pooled trust beneficiary dies, Medicaid gets what is left. But not in this case. Louise did die a few months after her pooled trust was established, but her pooled trust balance was added to Jerome’s trust without paying the lien. Why? 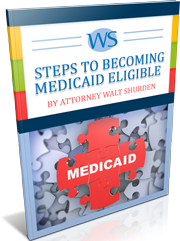 Because Florida does not enforce a Medicaid lien against a decedent who is survived by a spouse, child under the age of 21, or disabled child of any age. Today Jerome resides in assisted living with Medicaid benefits paying about $1,100 a month towards his care. He pays the balance of his care with his monthly income, and he or his power of attorney requests distributions from his pooled trust for personal needs. At Jerome’s death Medicaid will have a lien on his pooled trust balance. Pooled trusts protect your assets and allow you to get help paying for your care. These trusts work well for singles or married couples, both of whom need benefits. Medicaid gets reimbursed after the disabled person lives with dignity.